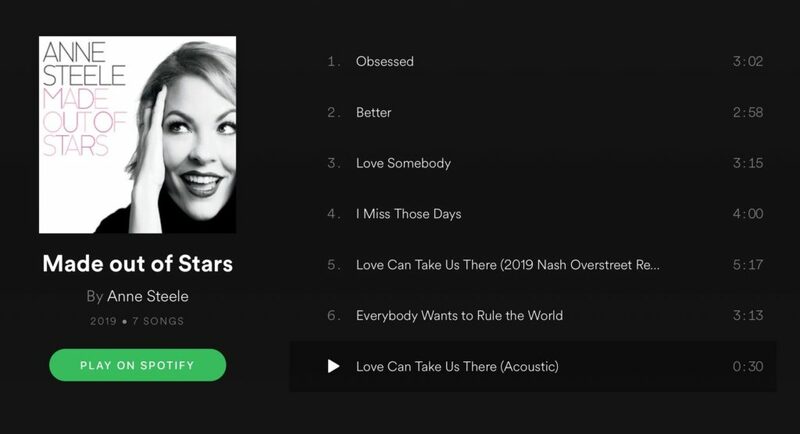 Anne Steele’s new album Made Out of Stars is a love letter to the fans of pop and the electro dance sound. With a throwback feel to the carefree 1980s, Steele plays on her best assets: A great voice and superior songwriting skills. Made Out of Stars opens with the fun “Obsessed,” the letters of which are spelled out in a catchy way. Is the subject “happily” obsessed for a change? “Better” has a hip-hop feel to it and would be equally suited for pop or rap lovers. “Love Somebody” is an electronic pop song made for dancing. “I Miss Those Days” is a melancholy trip down memory lane, but centering on the truth that your first friends knew you best. “Love Can Take Us There” is a great pop dance tune. “Everybody Wants to Rule the World” is a beautiful version of the well-known Tears For Fears song.